Hiking : Spectacular, rather long day hike. Or moderate overnight trip. 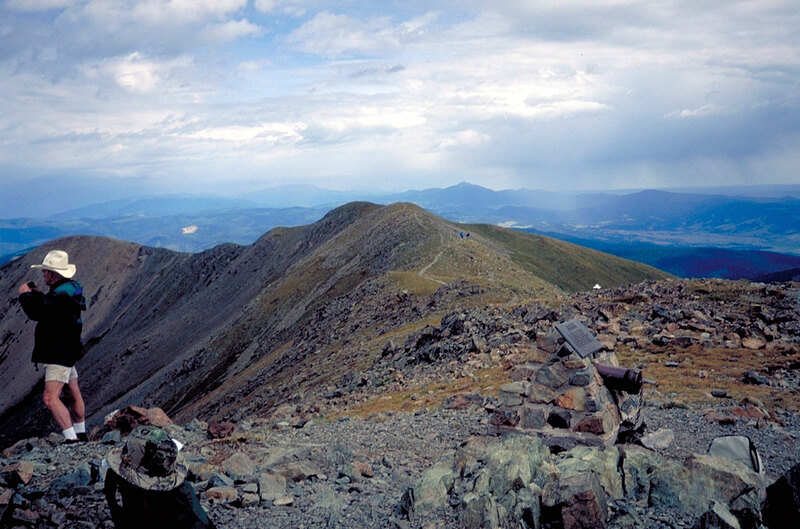 Wheeler Peak is the highest point in New Mexico at 13,161'. The hike to the summit via Bull of the Woods is about 15 miles round trip, and has an elevation gain from 9,000 to 13,161'. This climb is non-technical during most of the summer. 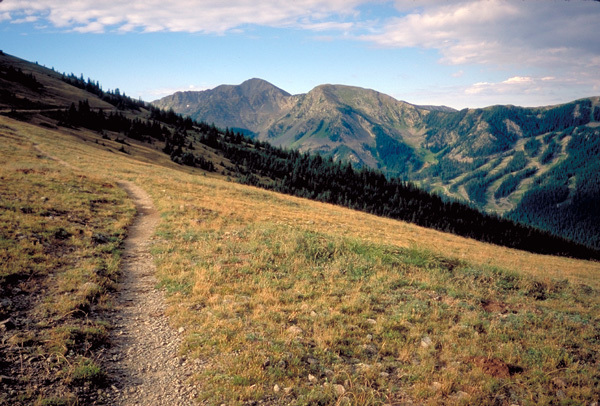 But extreme care should be taken during the thunderstorm season-July and August-since much of the Wheeler Peak trail is above timberline and exposed. Getting to and off the summit before thunderstorms this time of year will entail a near-dawn departure. Wheeler Peak is invisible, just to the left of the mountain in the distant center. Taos ski valley to the right.Click the picture to enlarge. 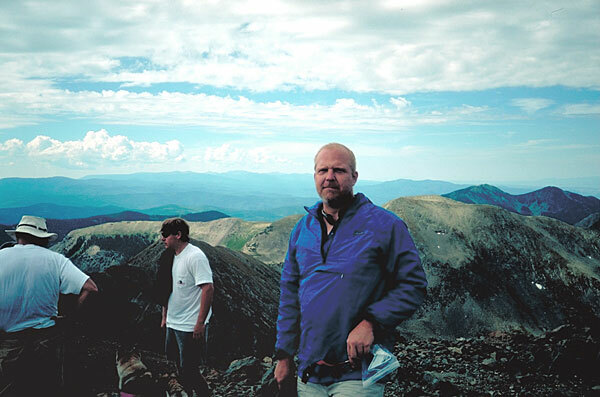 A hike to the summit in summer, 1997. I left a bit before dawn, actually, because driving up the previous day I had seen thunderstorms and severe lightning near Eagle Nest as early as 11:00 a.m. The trail leaves the trailhead at Taos ski area (the upper parking area) and threads its way among fairly heavy growth as it follows a creek. Ignore most of the footbridges across the creek; most of them go to the newly developed houses on the other side of the creek. As the guide books say, just stay on what seems to be the most heavily used trail (and the one going up). Eventually, the trail will join an old logging/mining road and ascend to Bull of the Woods pasture. There are a couple of confusing trail junctions early on; some of them not listed on the maps. So take a topo map with you and you can figure out the proper course to take. (I did.) After a couple of hours, you'll hit Bull of the Woods Pasture and the trail junction-you take a right here. This is a popular camping spot for people doing overnighters here. There's a good chance you'll meet up with the namesake of this meadow, or his wife. There's a lot of cattle grazing around here, taking advantage of cheap public land and messing up the trails. On up the trail to a saddle between Bull of the Woods mountain and the line of peaks leading up to Wheeler. Here's a good resting point if you're so inclined. [No pun intended.] There's supposed to be some old mines around here, but I didn't have the time to explore. There was heavy overcast in places, and I really wanted to get to the summit and back below timberline before noon or so. 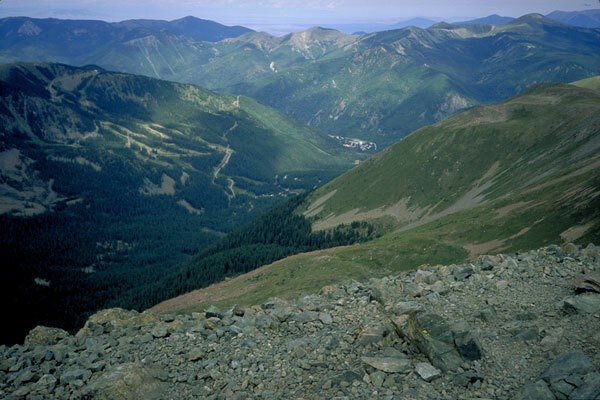 Summit view from Wheeler Peak, looking up Taos valley. Some people hasten their descent by hopping down this slope. I didn't. (Click to enlarge). Soon the trail emerges from the forest and for most of the rest of the trail skirts the edge of the mountain ridge. The views are pretty spectacular here, and you can enjoy them if, like me, the altitude begins to hit you here and you began to go slower. After you pass Frazer Mtn. (12,163'), the trail descends (inexplicably, to me) to a wooded area and creek, and I'm told that's a good camping area. But you lose substantial elevation at a time of the hike when you really don't feel like wasting steps. There's a cut-off here, made by numerous hikers, that bypasses some switchbacks--it's usually considered bad form to do so, but I'll admit I was tired enough that I took this bypass. I rejoined the trail shortly before descending into the saddle. I later realized most hikers bypass the saddle altogether, because as I emerged back out of the woods, a few hikers who had been way behind me were now catching up with me. From here on, the task is obvious, as the trail is a long series of big switchbacks to the ridge top, which it then follows to the summit. By this time, it being Labor Day weekend and all, I could see several hikers and parties of hikers making their way up. Most of them going pretty slowly, so I didn't feel so bad about my head-pounding heart-pumping lung-busting reaction to the 13,000'+ altitude. There's not much to say about the final mile-follow the trail, enjoy the views, and don't be too disappointed by Mt. Walter, a false summit (13,140') about 400 yards short of Wheeler. Up at the summit, there's a little rock wall (I guess if it were windy that would be handy), and some spectacular views. There are alpine lakes almost straight down, and in a pinch one could scramble down there quickly, but I think most people prefer the trail back down. Total time for the trip, for me, was about 8 hours (five up, three down).